Announcement ***NOTE*** From April 26th to May 5th I will be away from my studio and will have limited access to messages. I will respond to any inquiries as soon as possible. Any orders received during this timeframe will be shipped during the week of May 5th. 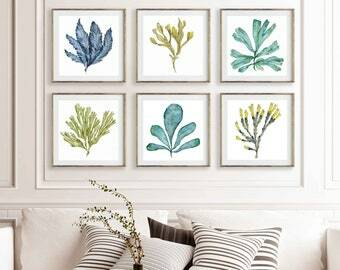 Watercolor animals, birds, botanical flowers, leaves and coral sea fans, and abstract wall art prints. FREE standard shipping will be applied at checkout to orders that include TWO listings or more. All items will be shipped to the same mailing address. 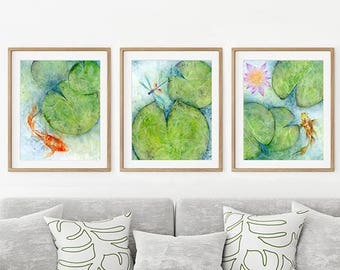 Welcome to SRorick Art where you will find a variety of my watercolor art prints of animals, birds and botanicals painted in contemporary and abstract art styles. 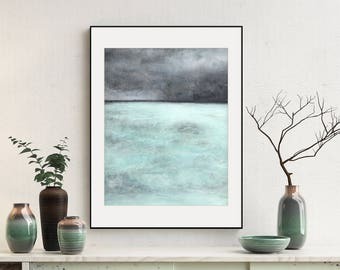 I offer giclee prints, otherwise known as fine art reproductions, of my original watercolor paintings as well as instant download printable art. Occasionally I will post a few of my originals for sale. 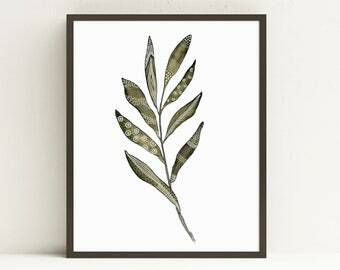 Favorite my shop if you'd like to stay up to date with my newest artwork that is available for purchase! 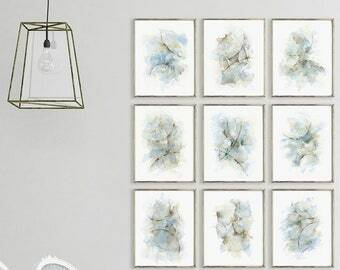 Please check out my latest collection of print sets in the Abstract Art Prints section. 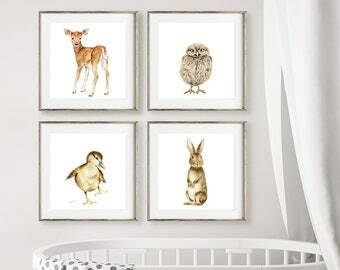 I also have nursery and children's art prints featuring woodland animals and safari animals, which can be found in the sections titled Animal Art Prints and Nursery Print Sets. I am meticulous about the quality of my prints. 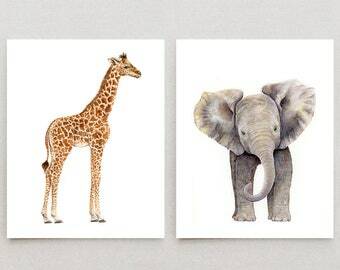 All of my art is printed on 100% cotton rag fine art paper that meets museum quality archival standards. 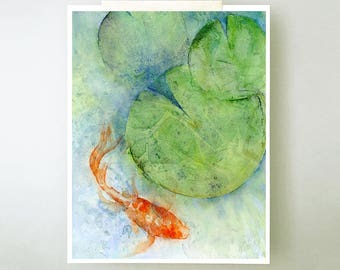 The paper I use is heavy weight and has a smooth texture that is characteristic of hot press watercolor paper. 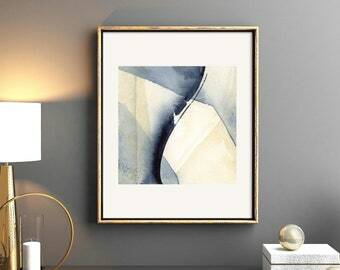 To ensure the highest quality, I make each print individually on a professional Epson fine art printer using eight colors of HD Ultrachrome pigment inks, which are well known for longevity. 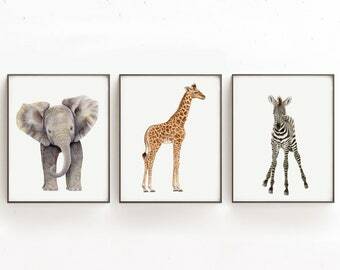 Your prints will last for generations! 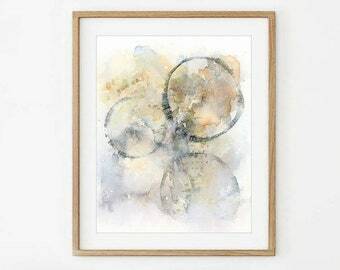 If your looking for printable art downloads, please visit my other Etsy shop called "The Art Compass" at https://www.etsy.com/shop/TheArtCompass where I offer some of my watercolor prints and selection of new works in digital download format. For more information about my shop, or myself, please check out my About and Shop Policies sections. Let me know if you have any questions. ***NOTE*** From April 26th to May 5th I will be away from my studio and will have limited access to messages. I will respond to any inquiries as soon as possible. Any orders received during this timeframe will be shipped during the week of May 5th. Everyone who comes to our house wants to know where I got this beautiful print! 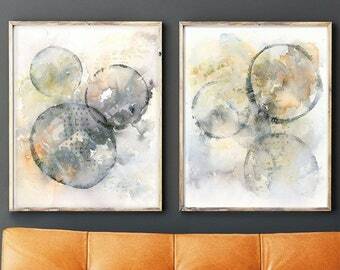 The most recent addition to the abstract collection. Something new in grey and blue ... with a hint of cream. Our adorable black lab who is a painting companion, dog model, kayak captain, and enjoys riding in the old Jeep. My art studio - a work in progress. One of my favorite places to take photos … my Mom's flower garden. 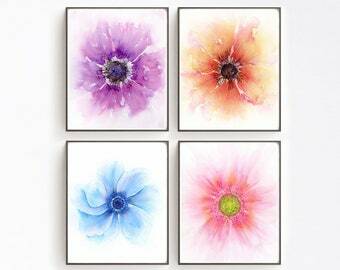 I'm very passionate about art in many forms, but watercolor painting is my medium of choice. I find it's a very exciting and sometimes unpredictable medium to work with. You don't always know what the paint is going to do when you put it on the paper, which makes it both fun and challenging to work with. Watercolor painting has been a constant learning process over the years and I've enjoyed everything about it! Living in the West Kootenays of British Columbia for most of my life, I have been fortunate to be surrounded by breathtaking scenery and an abundance of wildlife. My parents, who live close by, have beautiful gardens and a small orchard, which I frequently visit to take photos of a variety of flora and fauna as subject matter for my paintings. When I'm not painting, I'm usually looking for the next subject to paint such as the bull elk that strolled through our front yard in the early morning mist, the curious loons that came within 10 feet of my kayak, or our adorable black lab in his bright red life jacket who always comes on our kayaking trips. Yes, that's him in one of the pictures above. The materials I use to produce the watercolor paintings include Arches, Fabriano Artistico, and Saunders Waterford watercolour paper and artist quality paints from Winsor Newton, Daniel Smith, M. Graham, Sennelier, and Schmincke. I produce the archival reproduction prints (giclees) on an Epson Professional Imaging SureColor P800 fine art printer, which uses the UltraChrome® HD eight-color pigment ink set. Permanency tests conducted by Wilhem Imaging Research (http://www.wilhelm-research.com) indicated that this type of pigment ink is expected to last 200+ years in proper storage. 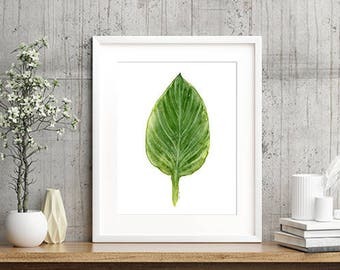 For the prints I use archival fine art paper that meets museum quality standards and is 100% cotton rag, heavy weight (250lb to 300lb), and acid free with no optical brighteners. 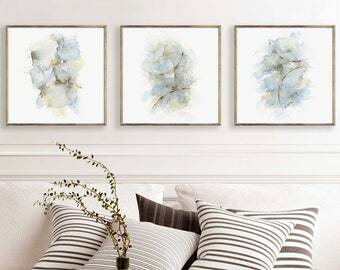 Many people have thought they were looking at the original watercolor paintings until I told them they were actually looking at the prints! 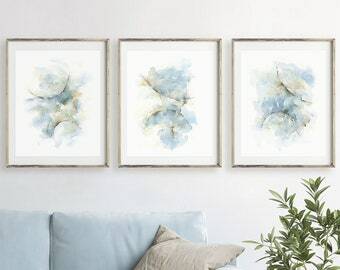 If you're looking for downloadable digital prints, please check out my other shop called The Art Compass https://www.etsy.com/shop/TheArtCompass where I offer some of my watercolor prints from this shop and selection of new works. I hope you enjoy looking at my shop! Please send me a message if you have any questions. SRorick Art is based out of Castlegar, British Columbia, Canada. To fulfill your order, certain information is needed from you (which you authorised Etsy to provide to me), such as your name, email address, postal address, and the details of the product that you’re ordering. You may also choose to provide me with additional personal information (ie. for custom orders) at your own discretion. Your information is not shared with anyone outside of Etsy, except for the postal service in order to deliver your shipment. For purposes of EU data protection law, I, Suzanne Rorick, am the data controller of your personal information. If you have any questions or concerns, you may contact me through my Etsy shop at www.etsy.com/shop/srorickart. I can print any size up to 16x20 inches. If you don't find the size you are looking for, please contact me. Yes. Please let me know when you need the item delivered and I will provide you with a quote for expedited shipping. Custom and personalized order inquiries are welcome! I will do my best to accommodate. What should I do if I'm dissatisfied with my purchase? My customers are important to me. I want to assure you that if you're not happy with your purchase, I will work with you to make it right or I will refund you the purchase cost (not including shipping), once the item arrives back at my address. The item must be returned undamaged in its original packaging. Don't worry! In the unlikely event your order is lost and does not arrive within six weeks from the shipment date, I will gladly send you a replacement at no extra cost. Please note that the claim period for a missing order is eight weeks from the shipment date. My prints are available for wholesale. Please contact me for further information.